How do you work on your business instead of in it? Lots of owners want to do this, but really aren’t sure of how and thus most often don’t. Well, here’s the first step. Establish your budget which is your plan. A budget is essentially estimating next year’s income statement. How much you plan to sell (income) and how you plan to spend it resulting in money left over, hopefully. Note: in the CPrint program, we are able to do this with you and it’s painless. 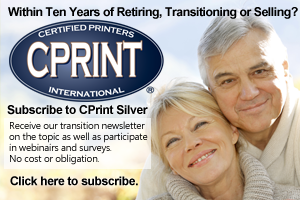 Message me at tom@cprint.com and let’s start a conversation. Do you need more cash in the business? Begin by calculating your current ratios and day’s cash on hand from your balance sheet. Current is defined as twelve months. Your balance sheet should be classified as to current assets, non-current assets as well as current liabilities and non-current liabilities. Current assets, for instance, are cash, accounts receivable and inventory and anything else that will turn into cash in twelve months. Current liabilities are accounts payable, taxes payable, current portion of notes payable and anything else that will require cash in twelve months. Say you don’t have a good financial statement? Many don’t. Never fear, we can help you get there. Just message me at tom@cprint.com and we’ll chat. No cost or obligation. Current Assets divided by Current Liabilities will give you a ratio such as 2:1. That means you have $2 of current assets for each $1 of current liabilities. Owner stress is lower when the current ratio is 2:1 or greater. A current ratio of 1.5:1 or less increases your stress. A current ratio of 1:1 or less like a 0.5:1 causes an immense amount of stress for you will have a hard time paying your bills. A second important measurement is days’ cash on hand. Cash on hand is cash and anything that will turn into cash within 24 hours or so like a savings account. Simple calculation for this (not exactly technically accurate but close enough) is to divide your years’ sales by 365. $365,000 of sales divided by 365 days is $1,000 or one day’s cash. Have $20,000 cash on hand and divide by the $1,000 one day’s cash and you have 20 days’ cash approximately. Your business needs 30 days to reduce your stress. At this point, one of two conditions exist. You need to earn money and leave it in the business until you achieve the strength goals of a 2:1 Current Ratio and 30 days’ cash on hand. Or you are there already. If you are there already, then you may withdraw additional funds from the business as they are earned. How much? That can be estimated using the Cash Flow Budget. We use the income statement to help us plan what our next period’s (like next month or next year’s) income statement will be. It could show something like $500k in sales – $400k in expenses (direct materials, labor, overhead) = $100k Income Before Owner – $50k owner salary = $50k net income THEN (this is the cash flow part) add back depreciation and interest deduct payments and deduct any additional owner withdrawals, dividends or distributions = +/- cash. This gives you a rough projection of how much cash you will either build or lose within the next period. Then work to meet the budget with confidence (worry, like stress, is lessened through exercise – knowing what you have to do in business and then doing it is the business version of exercise). In this budget process any big issues will be visible. Issues like pricing is too low, too many people, too much in certain overhead items, equipment financing issues and a dozen more possibilities. Point is, if anything is out of whack, then it will be visible. So, IF something is out of whack, fix it. Raise prices, reduce costs or do a work around. Implement the changes needed until you are building cash. IF nothing is out of whack, complete your budget (plan) and make it happen. 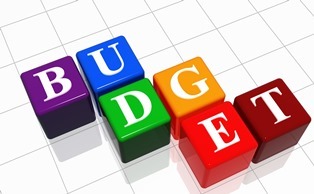 The biggest problem most have in budgeting is to determine what their sales will be. Some folks even assume they will have increased sales. After a lot of years helping with budgets, we use a Sustainable Sales level for budgeting. Take your sales for the last twelve months. Remove the HIGHEST three months of sales. Now take an average of the remaining nine months and multiply that average by twelve (months). That is your sustainable sales number that is used in cash-flow budget (you work to sell more, but this is a financial budget not a sales goal). This way, in your down months, you won’t lose cash. In your up months, you will pile up cash quickly. Point is, don’t use your up months to make up for your down months. Now account for the three elements of your expenses or costs: direct materials; wages walking out the door; and overhead. Direct Materials: if we printed nothing we would have no direct material costs. Right. Direct materials are expenses that vary directly with sales such as paper, ink, solvents and solutions. If you printed nothing, you would have no direct material expenses. One tricky spot for us is digital equipment that has excess “meter” clicks. If you pay a flat fee for a digital do-dad lease which includes so many “free” impressions, then that is expensed in overhead. Excess meter clicks or the amount you pay which varies with the amount of your monthly impressions is a direct material expense. So, when you record such an invoice in your Accounts Payable, split it into two parts; the “fixed” expense or the amount you would pay if you produced no images during the month; and the “variable” expense or the amount you paid because you made excess impressions. Once direct materials are identified properly, then budgeting for them is easy. Convert your historic expenses to a percentage of sales. If you sold $500,000 last year and you had $125,000 of direct material expenses, then you may assume that it will remain constant at 25% ($125,000 / $500,000). Yes, that’s right. You do NOT need to budget for the separate line items here like paper, ink, solvents, solutions or meter clicks. A simple percentage will do. Wages. More precisely, wages walking out the door. If you pay a family member $36,000 a year for no work, then that is accounted for in Owner’s Compensation, not wages. And here’s where what you paid in the past isn’t as important as what you are going to pay in the future. List all of the employees you are planning to pay along with their hourly, weekly or monthly pay. Multiply their pay by the appropriate time period and you will get the amount you plan to pay them over the next twelve months. For instance, someone paid $20 an hour is multiplied by 2,080 hours a year and results in $41,600, someone paid $500 a week is $26,000 ($500 x 52 weeks), or someone paid $4,000 a month is $48,000 ($4,000 x 12 months). No, you don’t deduct for vacation or holiday pay because you pay them for that. You’re trying to obtain the amount you are planning to pay in the next twelve months. Payroll Taxes and Benefits: here we again turn to our friend the percentage to keep things simple. You do NOT need to account for every line item within payroll taxes and benefits like FICA, FUTA, health insurance or whatever. All that’s needed for a first cut budget is to compare the amount of these items you paid with the wages (walking out the door) which were paid. That will yield you another percentage so you may say for every $1 in payroll historically paid, I paid 20 cents (20%) in payroll taxes and benefits. Then, mark up your expected wage expenses for next year by the payroll tax and benefit percentage (for instance, $125,000 in gross wages x 1.20 = $150,000 total pay with benefits and payroll taxes) to give the expected wages for next year. Overhead. This is probably the easiest of all the estimate in your budget. Overhead is everything that is expensed that is not a Direct Material nor a Wage. It’s everything else like rent, advertising, depreciation, dues/subscriptions, delivery expense, etc. Determine what you actually spent on each line item on a yearly basis and then estimate what you will spend on it this year. Rent going up? Utility rate hikes in your area. What are you going to do in the way of advertising. Depreciation? Use what you spent last year until your accountant tells you it will be different. Once you have completed the individual account estimates, add them up and that’s what you are planning to spend for overhead the next year. Take your Sustainable Sales minus the Direct Materials percentage minus Wages walking out the door, minus Overhead equals Income before Owner’s Compensation. Deduct what you will pay yourself and that will result in Net Income. Finally, to convert the accrual budget into a cash-flow projection, ADD to Net Income your budgeted amount for Interest and Depreciation. Now DEDUCT your monthly payments on notes you find on your Balance Sheet. While this isn’t precise, it will give you a good idea as cash-flow after equipment payments (capitalized or recognized on the Balance Sheet) are comprised of Principal and Interest. Depreciation is the recognition of equipment costs over time. A $100,000 piece of equipment depreciated straight-line over 5 years amounts to $20,000 per year. However, that’s not necessarily how we PAY for it. Suppose we borrow on a 3-year loan (disregarding interest), then we would pay the money back at a rate of $33,000 per year. So, for the first three years of our example, depreciation and interest (although we are disregarding in this example), would amount to $20,000 per year while payments would be $33,000 thus we’d have $13,000 more going out than coming in. In the final two years of the five-year note, however, it would be just the reverse. We would have $33,000 worth of depreciation expense but NO payment as the note would have been paid off. This is the type of discrepancy that occurs between the accrual budget and the actual cash transaction. Withdrawals: one final item is any planned withdrawal, dividend or distribution. Most commonly owners withdraw enough funds to pay for their income taxes on business earnings during the year and sometime even more. Regardless of what it is for, plan for it by DEDUCTING from cash flow. Estimate your final cash flow by accounting for the hidden costs. To Net Income, ADD Depreciation and Interest budget expenses and DEDUCT payments made on Balance Sheet notes (usually for equipment purchases). Then DEDUCT any planned Withdrawals and you will see whether your budget-plan will result in a cash addition for the year (positive number) or a net cash loss (negative number). If negative, start back at the top and change something in the plan to allow it to meet the financial goals. Then, just meet or beat your budget every month and don’t spend more than you plan to spend until you get to the targeted current ratio and days’ cash on hand. It’s guaranteed and as easy as adding and subtracting and much worry will disappear. If you have questions on this process or like more information on how our program could help you, please message me at tom@cprint.com. There’s no cost or obligation.